Two poachers in Quang Binh province went into Phong Nha forest with their AK gun and 5 bullets and killed 4 endangered langurs. News on Monday, August 28th, 2017 by Hoang Tao – VnExpress. The image is one of the poachers – Ai with his AK gun and the evidence. 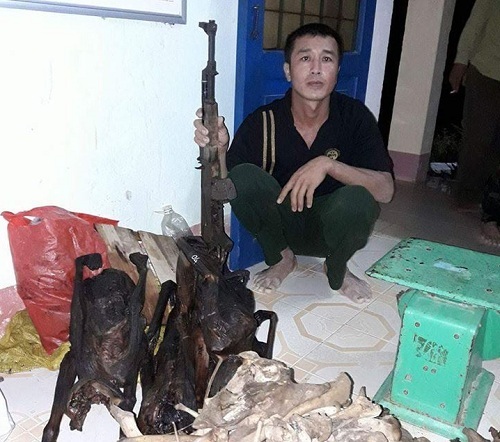 In the morning of August 28th, the policement at Bo Trach disctrict (Quang Binh province) examined the rusted AK guns in order to clarify the case of 2 illegal poachers using guns to shoot langurs in Phong Nha – Ke Bang National Park. 2 days ago at noon, the rangers of Phong Nha – Ke Bang National Park discovered 2 men with 2 big sacks coming out of the forest. Seeing the rangers, 1 man dropped the bag and escaped. The rangers caught Hoang Duc Ai (43 y.o, resident of Phuc Trach village, Bo Trach district) with 4 dead langurs with total weight of 12,6kg and 17 kg of unidentified wild animal bones. These langurs were shaved, toasted up and their brains and organs were taken away. Initially, Ai confessed that 10 days ago, he and his crime partner went into the forest with the AK gun and 5 bullets to hunt for animals. 2 poachers together shot 4 langurs – each one got 2. The animal bones were found at the traps and would be brought back for sale. Responsible people discovered that these 4 dead langurs are Hatinh langurs, 1B Endangered which are endemic in Eastern Asia. They mostly inhabit in Phong Nha forest and some areas in Laos.